drilled satin white freshwater pearls. 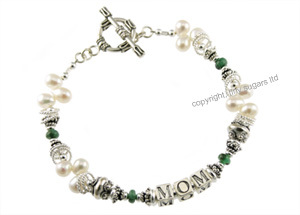 The Akiko in Emeralds Mothers Bracelet features genuine emerald precious gemstones. These emeralds display vivid solid green color with a smooth polished finish. the length and the number of letters in your jewelry design.